Hyundai 15hp 4-stroke petrol engine. Trolley Kit for easy movement. 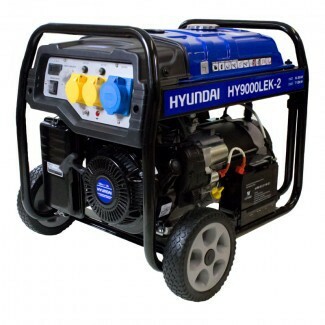 The HY9000LEK-2 is a powerful yet easily portable 7.5kW / 9.4kVa* open frame generator from Hyundai. 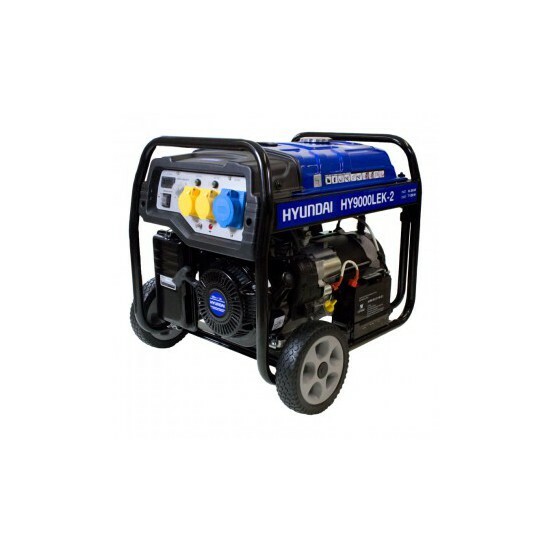 Designed for both home and commercial use the HY9000LEK-2 is powered by a 420cc / 14hp economical single cylinder Hyundai 4-Stroke engine. The 4 Stroke (or 4-Cycle) engine means there is no requirement to mix oil and fuel, simply fill in the relevant separated tanks. Weighing only 89kg, the HY9000LEK-2 is easy to maneuver due to its built-in wheel kit, rugged open frame and folding handles. The Hyundai AVR alternator keeps the voltage output smooth, within +/- 3% of 230V. This means it can be used to power sensitive equipment such as computers, laptops and charge mobile phones. However, the AVR alternator is also rugged enough to handle the harsh demands of power tools and building site equipment. The HY9000LEK-2 is an all round workhorse. Suitable for industrial and home use the HY9000LEK-2 is a highly versatile open frame generator ideal for powering power tools, compressors, welders, lighting rigs, garages, mobile workshops or sensitive home equipment such as laptops, sound systems, TV’s….etc. With low service and maintenance requirements, the HY9000LEK-2 is incredibly user-friendly, and has full Hyundai UK parts back up. The wheel kit can be assembled in minutes and just requires two bolts to be tightened for the rear legs and the axles held in place by a single R clip for each wheel. The folding handle is already assembled and comes as part of the main frame.